Feline elimination problems (spraying or inappropriate elimination) are one of the most common behavioural problems seen in cats. Spraying (urine marking) refers to an action which relays a message to other cats about territory. Inappropriate elimination on the other hand refers to urinating or defecating on or in a place other than the litter box or outside in the garden, not related to the marking of territory. Urine marking behaviour is normal in cats although unpleasant for the owner. Cats use the senses of sight, smell and hearing to communicate with each other. As cats are hunters, they tend to communicate over large distances, to not infringe on another cat’s territory. Some cats will vocalise to get their owners’ or other cats’ attention; such as when they want to be fed or let out or when they feel threatened. Cats which are close to each other will look at the other cat’s body posture or facial expression to establish what the mood of the other cat is. Facial expressions and body postures in cats are subtle and signs related to stress or discomfort will often go undetected by humans. The sense of smell (and creating pertinent smells) is one of the most important ways of communication between cats. Scent is produced and spread by four main areas: the face, the flanks, the tail base and the paws. By rubbing their faces and flanks against an object, cats communicate that they are feeling safe and comfortable. Urine and faecal deposits tend to say: “stay away…this is my territory”. By spraying, cats deposit a message at the correct height for smelling by other cats. Intact males show the highest incidence of urine marking behaviour, but sterilised males as well as females will spray. Intact males spend a great deal of their time marking their home range, particularly near boundaries, pathways and crossings. Although spraying is a normal part of feline behaviour, it becomes a problem for humans in a domesticated scenario, because of the bad smells and damage to furniture it causes. Inappropriate elimination on the other hand, is not a normal part of feline behaviour, and when this occurs it usually signifies some underlying behavioural or medical condition. So how do we differentiate between the two behaviours? Marking territory by means of spraying is a form of communication rather than a means of emptying the bladder. The demographic area where it occurs is of importance. The stance, postural positioning and behavioural patterns usually associate with spray marking are classic with a cat backing up to a vertical surface, treading with the back feet, holding its tail up high and quivering the tail tip and base whilst releasing small squirts of urine under high pressure onto a vertical surface The cat will usually have an intent expression on the face. A cat marking its territory may occasionally deliver a small amount of urine onto a horisontal surface if they want to mark such an object is in a strategic position, such as a gym bag. They do not dig a hollow and will still use the litter box for urination. The substrate on which a marking cat stands when they mark by spraying does not matter. As can be seen from the statistics the motivation for spraying in the majority of cases is typically territorial behaviour related to situations of interaction with other cats (positive as well as negative) Conflict where a cat may feel threatened by the presence or visitation of another cat to its territory is a sure starter for spraying behaviour. Changes or disruption of a home environment may lead to anxiety, stress and insecurity, which in turn may lead to a cat starting to mark its territory by spraying. Urine marks are then often found in or near socially significant areas such as windows, doorways, curtains and beds. The owners’ reaction to the marking may also aggravate the problem. As soon as the owner cleans and washes the sprayed area, the cat goes and marks it again to make sure the scent is refreshed and strengthened. This could lead to a viscous cycle of washing and spraying. Overcrowding of cats in the same household can cause anxiety and a perceived lack of resources. This will be made worse, when competition with outside cats already exist. Spraying cats often try to assert themselves in a house with a hostile social environment where there is tension between feline housemates. Spraying is often a passive form of aggression where both the attacker and victim will mark their territory. The aggressor may elicit and start the marking behaviour, which is then perpetuated and maintained by the defender. A common cause of spraying is distributing the scent to advertise reproductive availability and the need to mate. In nature this is a very useful tool for survival of a species, but naturally in a domestic situation it is a nuisance. Any disease that influences the frequency, urgency or quantity of urination could present as a urine marking problem. It is therefore important that the vet rules out any possible medical problems. As an example: Pain, caused by cats suffering from arthritis, may cause difficulty for the cat in getting into or near the litter box. Sometime a medical problem may initiate spraying, but after resolution, the cat’s learnt behaviour may sustain the problem. During inappropriate elimination, the cat’s main aim is to empty the bladder. The cat chooses a spot other than the litter box he/she is comfortable with (usually a quiet, secluded spot), goes into a squatting posture and delivers a large amount of urine or faeces, if they are able to. The cat will tend to show the typical ground scratching behaviour before and after the elimination. The underlying motivation for inappropriate elimination may be related to an aversion to the litter box (dirty litter, location of the box, litter type, box type, etc) but can also be triggered by an underlying medical condition or anxiety. 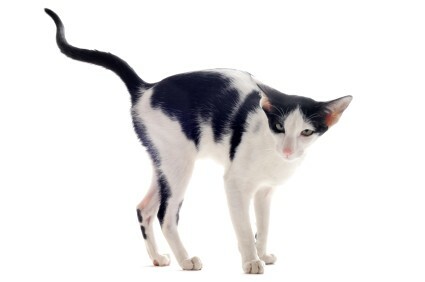 Pain associated with urination or defecation process may cause the cat to associate the pain with the substrate type, or the location of the box. Small amounts of urine may therefore be found throughout the house. Urine passed during painful urination is usually smaller in volume, has a strong odour and may contain blood. In the next article we will look more into the medical reasons why cats suffer from inappropriate elimination and the diagnosis and treatment of both marking and inappropriate elimination.